Riding bikes is what the club is all about. We love that many of our members have started riding bikes from scratch or after a long period away, and have become inspired to be the regular core of the rides on a Sunday morning. It goes to show what a lot of motivation it can provide to have a constant source of mates to ride with, almost no matter what the weather. Riding with a group is fun! We always wanted the emphasis of our club rides to be on the social element. Nobody is perfect, but a club ride is meant to be just that – a social experience where the group rides together at a suitable pace for all, with a stop for coffee and chat either part way through, at the end, or both! There are several groups for that reason, and we work very hard to encourage people to ride with the appropriately paced group. 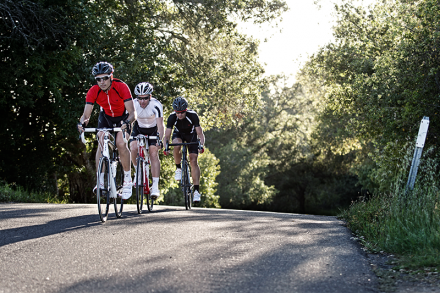 Newcomers are encouraged to start with one of the slower paced groups so that they can get a feel for club riding. We would positively hate to lose someone on a first ride out, so we would prefer it if they were the ones who needed to move into a faster group next time rather than constantly worrying that they can’t keep up on their first ride. The rides are published on the Calendar page, click on a ride on the calendar to see details, sign up for the ride or to see who else has signed up. There is also a description of the various ride groups and the average speeds they ride at. This comes in the format of a link to the ride on RidewithGPS.com, a website you can register free of charge and see the map with the route marked on it. If you don’t have a GPS you are advised to either print the map or write yourself some directions, as we do expect everyone to know where they are going and be able to get themselves and their group back if necessary. The Sunday rides always start in the Cranleigh Leisure Centre carpark. Meet up times are 8.15am for an 8.30 start in the summer months, and 8.45 for a 9am start during daylight saving hours. This applies unless there is an event planned, details of which would be given in the newsletter. Further rides take place on a Wednesday morning at 9.30am starting at Beyond Mountain Bikes in Smithbrook Kilns, and on a Saturday morning at 8am, again from Beyond. The Wednesday ride will be at a social pace. The Saturday ride is under development. A fairly briskly paced ride currently takes place every Saturday followed by cake and coffee courtesy of Beyond. Non-members are welcome to join in on all the rides for a total of four rides. After this, they must join the club. This is for insurance reasons. Please let us know if you plan to ride but are not a member. You must carry a photo ID and an emergency contact number on your person to ride with the club, as do all club members. If you don’t have a suitable bike please contact our Rides Coordinator who may be able to arrange for a bike for you to try. It is strongly recommended that all CCC members join either British Cycling or Cycling UK (formally CTC) which will give them insurance cover as well as many other discounts and benefits.